Several months ago, when Mr. HapaNom and I were driving from the East Coast to our new home in the Bay Area, we stopped in Southern California to see my dad’s side of the family. We stayed with my aunt and uncle and before we shoved off to continue on our journey, my aunt hosted a lunch for us with the rest of the CA family invited. My aunt set out a table full of various veggies, grilled meats, sauces, and several large bowls of white and brown rice. It was brilliant! Everyone could pick and choose exactly what they wanted! This is obviously perfect for family get-togethers, but it also works for sports gatherings, holiday parties, or just pick and choose what you want! Think of all of the combinations you and your guests will have! 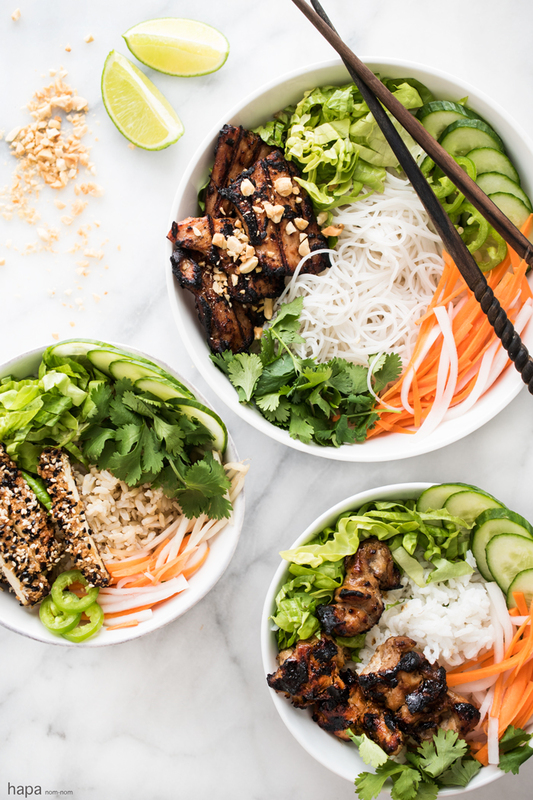 Whether you have a vegetarian, someone on a gluten-free diet, or a meatlover – Build Your Own Bowl has got you covered. 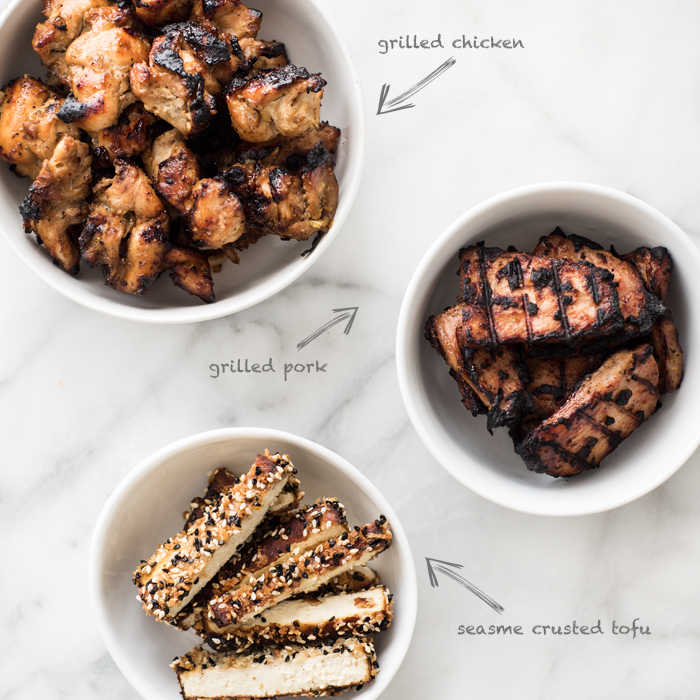 Just as a heads-up if you’re party planning – the pork and the chicken are marinated for 2 hours to overnight. Happy eating! Prepare the ingredients according to package directions. Pound the meat out to a ¼ inch thickness and cut into vertical strips to thread on skewers. To make the marinade – add the muddled scallions, garlic, sugar, fish sauce, soy sauce, molasses, sesame oil, and black pepper to a mixing bowl. Stir to combine. Divide the marinade into two large zip-top bag and add the pork to one and the chicken to the other. Seal the bag and turn to coat. Refrigerate and allow to marinate for 2 hours to overnight. Soak the bamboo skewers for 15 minutes. Preheat the grill to high heat. Thread the meat onto the skewers, working the skewer in and out of the meat, down the center. Once the grill is ready, oil the grates with vegetable oil. Place the meat directly over the flames and cook for approximately 7 - 10 minutes, turning frequently until the meat is cooked through with a bit of char. If you would like to use the oven instead, place the meat on a baking sheet and cook under the broiler for 4 -5 minutes per side, or until cooked through. Using a clean tea towel, firmly press the block of tofu to remove any excess moisture. Slice the tofu to ½ an inch in thickness, then slice to a manageable width (approximately 2-3 inches wide). To make the marinade, mix the soy sauce, rice vinegar, mirin, and sesame oil in a large zip-top bag. Add the tofu slices, close the bag, and gently move the tofu around to coat. Allow to marinate for at least 30 minutes, periodically turning the bag to coat all sides of the tofu. 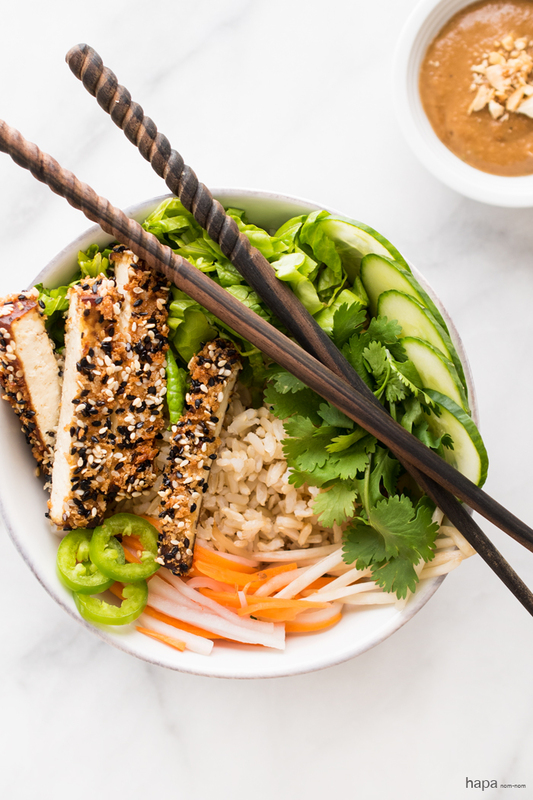 Remove the tofu from the marinade and remove the excess moisture by pressing each piece firmly between several paper towels. To set up your dipping station, beat one egg with 1 tablespoon of water in a bowl. In a separate bowl, add the panko and sesame seeds – stir well. Working with one slice at a time, dip the tofu in the egg mixture, being sure to coat the entire piece. Then transfer the tofu to the panko-sesame mixture, turning and pressing to coat. Transfer the sesame crusted slices to a large dish and momentarily set aside. Over medium-high heat, add enough oil to cover the bottom of a heavy-bottomed skillet. Once hot, add the tofu slices in batches. Cook for 2-3 minutes per side, or until golden-brown. Lift the tofu out of the skillet and allow them to cool on a plate lined with a few paper towels. Once cool enough to handle, slice each tofu piece into bite-sized pieces. ** If you can find ‘Ultra Firm Tofu’ that will work best. However, if you can only find ‘Extra Firm Tofu’, you will have to remove the excess moisture. Start by placing a colander in the sink. Place the block of tofu in the colander and then place the plastic tray the tofu came in or a small plate on top of the tofu. Then place some form of canned goods on top. Allow the tofu to drain for at least an hour. Combine all of the ingredients in a small bowl and set aside until ready to use. 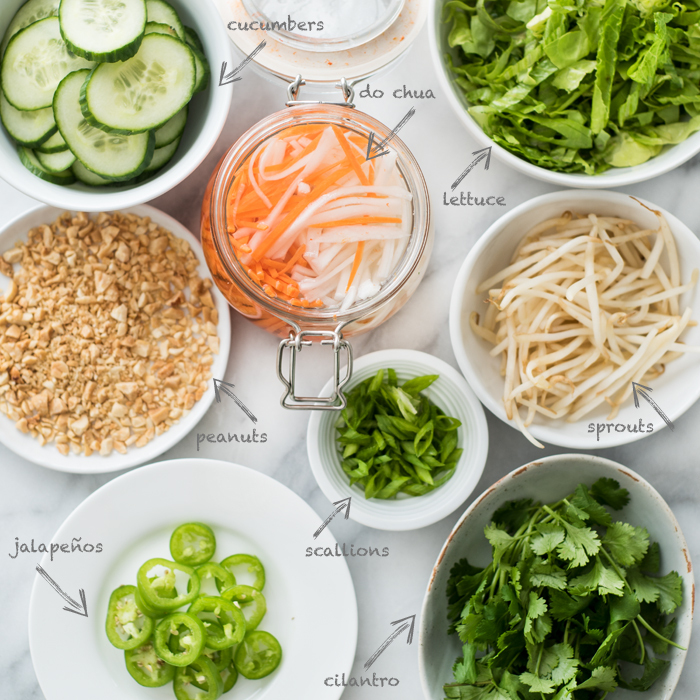 In a food processor, puree the Thai chiles, galangal, lemongrass, Thai basil, shallot, garlic, and shrimp paste. If you would like a smoother sauce, finish by using a mortar and pestle, although this is not necessary. Set the ingredients aside in a bowl separate from the food processor. Wipe out the bowl of the food processor and add the toasted sesame seeds and dry roasted peanuts. Puree until creamy. In a large pan over medium heat, sauté the Thai chili puree and the coconut milk. Stir constantly until fully incorporated. Then add the sesame seed and peanut mixture. Finally, add the red curry paste, sugar, fish sauce, orange juice, lime juice, and stir well. Add water a tablespoon at a time to create your desired consistency. Set aside and allow to cool to room temperature. *Galangal – there is really no good substitute for galangal, so a substitution should be your last resort. There are some that say that there is NO substitute for galangal, but lets be realistic – if you’re in an area that does not carry this exotic root, then throwing out the likes of that ingredient from the recipe entirely is a bit crazy…in my opinion. That said, first try the international aisle of your local grocery store or Asian food store. IF galangal is nowhere to be found, use the equivalent measurement of minced ginger with a pinch of mace and pepper. * Thai basil leaves – try a farmers market, one of those high-end grocery stores, or Asian food store. If you cannot find Thai basil, you may substitute sweet basil – just add a few more leaves to the recipe as Thai basil is stronger and spicier than traditional basil. *Shrimp paste – I have only seen this ingredient in International/Asian markets. However, if you cannot find shrimp paste, simply add the equal measurement in fish sauce. Most local grocery stores with an international aisle will carry fish sauce. However, in a pinch you may substitute soy sauce – although, the dish may taste a bit weak. Place everything into bowls and set out on the table. Serve with sliced limes and Sriracha. Enjoy! Thanks! 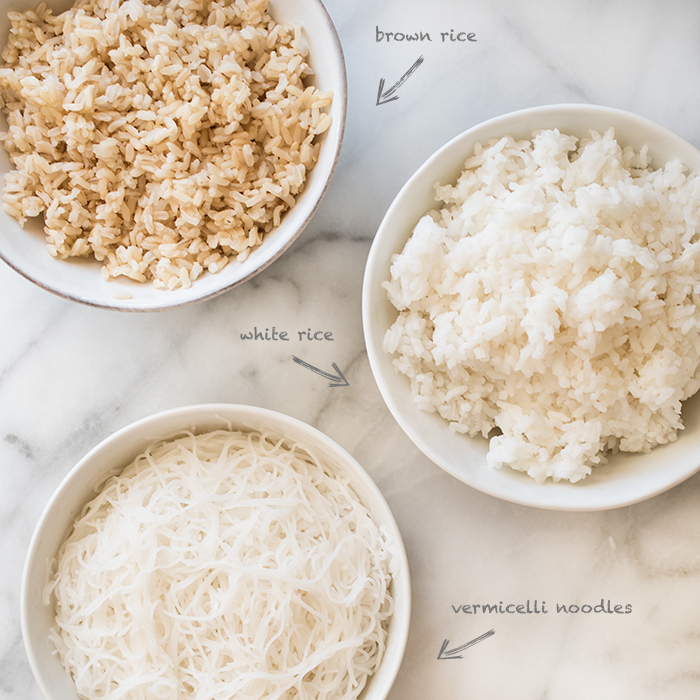 We wanted to do rice bowls for dinner club, and this was exactly what I needed. Just checking on the cilantro needed for the lime cilantro sauce … any amount you recommend? Hi Wendy. My apologies, I mistitled the sauce – can’t believe I missed that! It should be ‘Lime-Fish Sauce’. I frequently make the same sauce using cilantro instead of the scallions (probably why I mistitled it in the first place) 🙂 If you would like to use cilantro, just do an equal substitution of the scallions. there is nothing i tail wag over more than a 101-type post. push asian flavor profiles into the bundle and i am mad with anticipation. i am also all about how you applied handwriting to the photos with your marker. stylish and cool and then some. 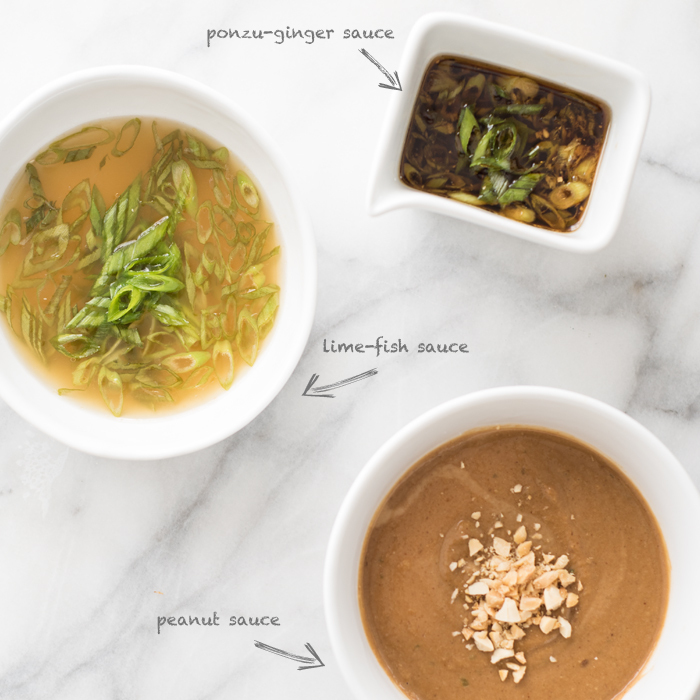 the sauce and protein recipes are 5star level… i dig how you are not fish sauce shy. your peanut sauce construct is making me experience a brain melt (two citrus juices and belacan? wow! yes, yes, yes please). do tell how much ginger you suggest in your ginger ponzu sauce please 🙂 i have no idea who or what or when or where i am going to do this, but i soooooo need to have this party you are pushing (idea level einstein). seriously, seriously standing ovation worthy, kathleen. i am such a rabid fan over your works. Aw… thank you my dear. Your comments always make me smile 🙂 I can’t believe I forgot the ginger in the ginger-ponzu sauce – big duh! It’s 4 teaspoons, grated – I went ahead and updated. Thanks for catching that! what a GREAT post!!!! I love this! Amazing! I could eat this every day! Thank you for the wonderful recipe. I made the chicken in my broiler with the ponzu sauce. Added a some mint. Just delicious. That’s wonderful, Chrissie! I’m so glad you enjoyed it! Oh my gosh I love this idea!! So creative! I think I would have a super hard time choosing between all of your amazing options! Love meal setups like this – great choices Kathleen! Everything looks great! Need to try the sesame crusted tofu ! What a fun party idea! I think I would want a little of everything or maybe just make myself 3 bowls… well how else would I get to try 3 delicious sauces… okay just give me one gigantic bowl. Just pinned! Ha! Yes, one gigantic bowl would certainly do! Have a great week my dear. This is an absolutely brilliant concept. I’ve been considering how to deal with food if my sister and her husband come to visit; he’s vegetarian, she is sort of, and we are not. So this would please everybody. Thanks for posting it. Thanks so much, Susan! It’s a great way to please a wide range of people. Hope you have a great weekend! YES!! This is what I do!! Well, to be honest, I usually only have one protein but the concept is the same. I love it!! I really like this idea of putting out even a bigger selection for larger groups. I’ve never done that before, this is fabulous! Pinning! Love this idea, Kathleen! I’m all for build-your-own parties and the Asian spin is perfect. Goodness! How do you choose? Sometimes I have trouble when everything looks so good… This is brilliant – I just might have to go in for seconds, though! Gorgeous post! Thank you! This is a fabulous way to eat. Everything looks so good I’d have to try a bit of everything. I love this! It’s like Subway, but actually healthy! Yum! Wow! I think perhaps you need to open your own lunch place – I’d be down there everyday! I love these bowls!